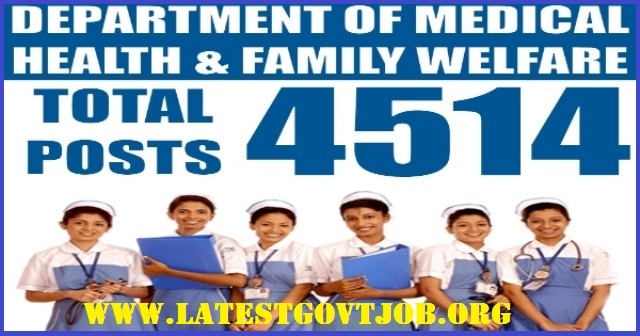 DMHFW Recruitment 2018 for Nurse Grade-II 4514 Vacancies | www.rajswasthya.nic.in : Department of Medical, Health & Family Welfare (DMHFW) has released a notification for the recruitment of 4514 Nurses Grade-II in Scheduled Area and Non-Scheduled Area. Interested candidates may check the vacancy details and apply online from 22-04-2018 to 22-05-2018. Educational Qualification: Candidates should have passed 10+2 and and GNM Course or equivalent from a recognised board/institute. Selection of candidates will be made on the basis of Merit List. Interested and eligible candidates may apply online through DMHFW website - http://www.rajswasthya.nic.in/ - from 22-04-2018 to 22-05-2018.